The Shark ION F80 MultiFLEX Or Dyson V10? Shark and Dyson are two well known vacuum cleaner brands. Their lineups consist of a variety of vacuums that are used mainly by homeowners or in a residential setting. While both are known mostly for full sized upright models that can clean a large home they have both developed numerous cordless options as well. And these cordless cleaners come with the latest battery technology to make sure they have the power for ALL types of floors, including carpets. The Shark ION F80 and Dyson V10 are two such examples that can handle any surface around your home. While there are other choices available we feel that these 2 represent the power and flexibility that a modern cordless vacuum has to offer. No longer do you have to be tied to an electrical outlet when deep cleaning your thick carpeting. Plus you have the advantage of removing the wand and using it in handheld mode (more on that below). The possibilities are much greater when comparing these vacuums to larger corded uprights, which explains the surge in popularity. Before we compare the F80 and V10 side by side in a variety of categories we’ll give a quick rundown of each model. 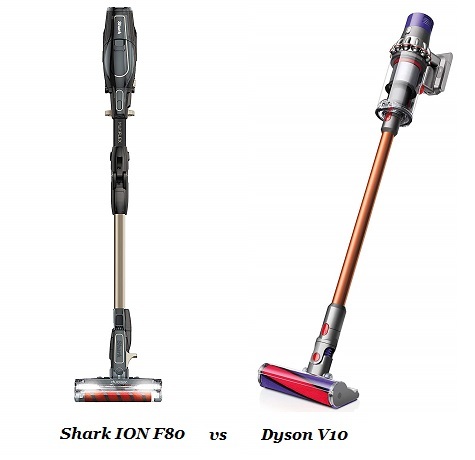 [Read more…] about The Shark ION F80 MultiFLEX Or Dyson V10? 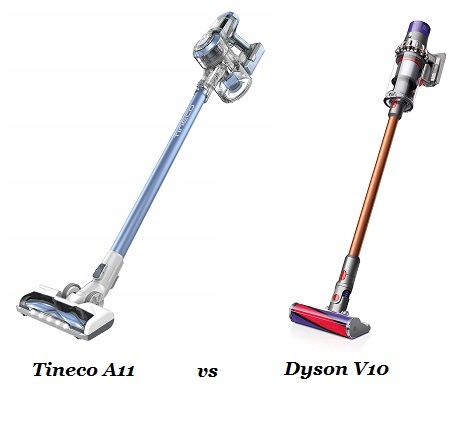 Can The Tineco A11 Compete With The Powerful Dyson V10? Most people know the Dyson V10 is one of the best cordless vacuums you can find today. It has extreme power and a long lasting lithium ion battery that can handle entire household cleaning sessions. What the majority of people don’t know is the Tineco company makes a similar vacuum that costs much less. The reason for this is Tineco hasn’t been a big player in the home cleaning industry for as long as Dyson, but that is changing. Can the A11 compete with the V10? Here we compare them side by side to answer that very question. Before we start it’s important to note just how much the cordless vacuum industry has changed in recent years. When you used to shop for cord-free vacuums you would be looking at ultra lightweight stick models with weak batteries that typically lasted 10 minutes or so. These machines would be used as a powered broom to pickup small dirt or food particles from hard floors. However, the battery technology has improved tremendously with the introduction of lithium ion. So much so that you can use some of these cleaners for deep cleaning carpets. The Tineco A11 and Dyson V10 are 2 examples of this. 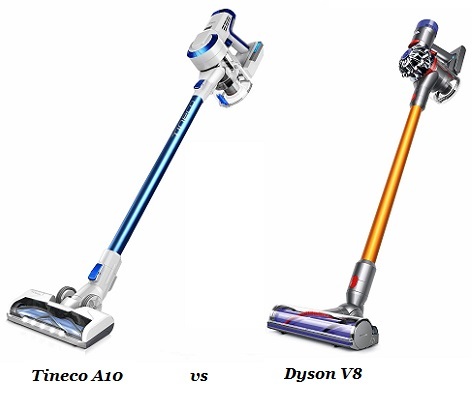 [Read more…] about Can The Tineco A11 Compete With The Powerful Dyson V10? Hoover and Shark are two very different vacuum cleaner companies with very different histories. Hoover is one of the mainstay brands with a long history of building vacuums for both professionals and homeowners (over 100 years). Shark on the other hand has not been around as long and their main focus is on residential cleaners that are full of innovation but low on price. Their company got popular through word of mouth mostly but today they are one of the best selling brands because they solve the cleaning needs that others simply do not. 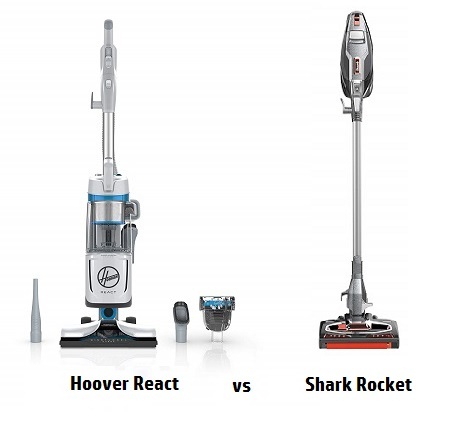 It’s no surprise that their respective lightweight corded vacuums, the React and Rocket DuoClean are so different but both are excellent choices depending on your needs. To find out exactly what those are, we have a side by side comparison here. Read on to learn more.